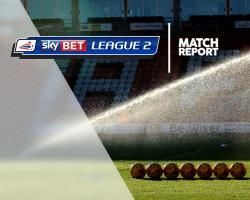 Sky Bet League Two strugglers Morecambe and Hartlepool shared the spoils in a 1-1 draw at the Globe Arena. The visitors dominated the first half for long spells and took a 1-0 lead into the break but a much better second-half display saw Morecambe hit back to take their first point in eight games. Lewis Alessandra received the ball in space on the edge of the box and played a neat ball through to Padraig Amond who scored against the Shrimps for the second time this season with a neat finish from 12 yards. Defender Ryan Edwards saw a shot cleared off the line but the ball rebounded perfectly for Paul Mullin to head home from three yards.